Golf can be an expensive hobby, and most beginners don’t want to splash out on a full set of 12-17 clubs at first. You don’t have to. As long as you have a driver, a couple of fairway woods, one or two hybrids, a few irons, a pitching wedge, a sand wedge and a putter, you’ll have the tools to play golf. Club faces come in a variety of angles, some of which make it easier for novices to achieve loft, distance and accuracy. When purchasing your first clubs, speak to a pro, to help you decide which will suit you best. This is one of the most important aspects of anyone’s golf game, and often the one that is poorly understood by beginners. This can be fatal: if you don’t start out knowing how to address the ball correctly, you will spend your life on the golf course trying to correct your swing or your putting, when it’s your alignment that’s letting you down. You want to be square-on to the ball. 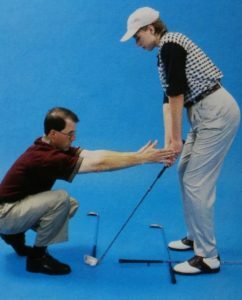 It helps to practise this with your buttocks pressed against a wall, so that you can feel when both hips are aligned parallel to the plane that you will be swinging your club in. On the course, a towel or professional alignment sticks can also help you to adopt the correct angle to the ball. On the downswing, you want your shoulders, elbows, wrists and the club all to move in a smooth rotation, remaining in the same plane. Getting this right starts on your backswing: too many beginners try to achieve this rotation with their shoulders only. If you watch the greats via live streaming on Australian sports betting sites, you’ll see that they straighten and lock their back leg on their backswing, and rotate their hips, torso and shoulders. On the downswing, hips and torso unwind along with the shoulders, produce a smooth rotation of the club in the correct plane, to provide maximum power and accuracy as the club face strikes the ball. Unlike ball sports with a bat, golf uses a weighted head at the end of a long, slim handle. Getting a feel for that club head, knowing where it is by the club balance alone, without having to look at it, is the key to success in golf. A few practice chip shots before every round will help you get that sense as a beginner. You should also focus on the ‘one-piece takeaway’: clubs, hands, arms and body must turn together on the downswing, as a single connected unit, as described above. You’ll play most of your golf on the fairways, except in the beginning, when you’re more likely to make friends with the rough; but golf games are only won on the green. Novices should probably start with a mallet putter, moving on to traditional putting blades when you have more skill. But practice, practice and more practice, no matter what club you’re using, is the only secret to improving your putting.